Miyamoto: Pikmin 3 Has Become "The Ultimate Version of Pikmin 1"
"After I made it, I played it and it's fun"
Pikmin 3, after a heck of a long wait, will finally arrive on Wii U on 26th July in Europe and 4th August in North America. It's also, based on his various appearances before and during E3 and the ever-presence of Pikmin toys in his vicinity, an important game for Shigeru Miyamoto. So often a figure of oversight on major releases, this is a title that appears to be more directly led my Miyamoto, with the iconic developer at the fore of any discussions about it. It was the inevitable subject, then, in a recent interview with Kotaku, in which Shigeru Miyamoto shared his view that the new title is a culmination of what he wanted to achieve in the GameCube originals. In a sense I almost feel sorry for the people who played Pikmin 1. What I really feel like is that, in Pikmin 3, we've finally been able to include all of the elements that I wanted to include in Pikmin 1. Often times, when you talk about movies, people say, oh the first one was the best... I feel Pikmin 3 has become sort of the ultimate version of Pikmin 1 if we'd had more power. ...With Pikmin 1 certainly we had the ideal we were striving for. With that game, I think we ended up with a basic ruleset of the game that was a little bit too strict and confining, the 30-day time limit in particular... from that sense it was difficult for people to get into that game, particularly if they were novice gamers.. And, I think the other challenge we had with Pikmin 1 was that people would want to go back and replay the game, but partially because of the limits—the time limit—people just felt it was a bit too much to go back and replay that again. And, with Pikmin 2, we wanted to focus on really trying to ease the gameplay to a certain degree so that it was easier for people to get into and play so we polished the Pikmin idea a bit but really only focused on how to make it easier to play. Whereas with Pikmin 3 we've really taken it and taken that Pikmin 1 ideal and really tried to bring that to life in a way that encourages replayability all throughout the game. Pikmin is also Nintendo's take on real-time strategy, with the typical whimsy associated with the company. A source of pride for Miyamoto is the design of the game giving the player a sense of freedom and expression, while he also stated that it should be balanced in a way to help players improve, steadily, with practice. You know, obviously video games are designed for the player to play the way the designer has intended them to. 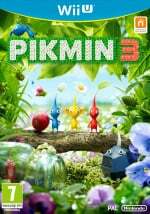 But a good game—and this is really where I think Pikmin 3 stands out—is a game that gives you enough freedom that the player can create their own way of playing and can find ways of playing that the developers didn't envision. I think Pikmin 3 is a game that is very much like that. There are so many options strategically and in terms of the items you're going after. Obviously the stage layout and where they've placed the items have all been done by the designers, but, because you're so free to choose your approach to it and your strategy, I think that people are really going to be able to think through on their own and really come up with creative ways of how to attack these levels. ...We've designed the game in a way so that, as you play it, you get better and better at it and start to understand the depth of the strategy and the best ways to use the Pikmin in it. After a lengthy wait, fans of the franchise and those simply hungry for Wii U games will surely be keen to dive into Shigeru Miyamoto's latest creation, particularly as he's taking such pride in the project. Is this one near the top of your wishlist? Sounds perfect. This game will surprise a lot of people. Well I won't be getting it day one since I have not played a pikmin game. The closest to me playing one was from nintendo land. Never played Pikmin but that is going to change once this hits the eShop! I love Pikmin, and this one is very near the top of my most wanted Wii U games, but I really hope he now moves onto that new IP we've heard mentioned. It's been far too long, since the original Pikmin for most people, since Nintendo produced a real new IP for gamers. This one is at the top of my wishlist. I've waited years for it and it'll finally be here soon! For those unfamiliar with pikmin, this series is highly recommended. Very unique, great style of play, and it oozes quality and atmosphere. I played the first one in New Play Control form on the Wii and thought it was great so this is a day one purchase. I know my daughter is also looking forward to it as the Pikmin game in Nintendo Land is her favourite. Nice to see it seems to be following the first one in terms of the story whilst expanding the scope. Pushmo/Pullbloxc proved people DO care. They just have to remember to include a good game too. Been waiting for this since I bought my Wii U at launch. Next time simply say you are not interested, it's not even a story driven series and all characters are new in this one, i will accept it better. Sorry for coming at you like this, i'm not angry but you can't tell just by reading, it's just that i'm bored when i see things that any multiplatform magazine or analysts could have said. I've never owned Pikmin, but I hope to try it when number 3 releases. Hopefully it will surprise me! @Grubdog I love Steel Diver, it's the most unique game on the 3DS, nobody gives those type of games a chance anymore,,,. Played 1 and 2 twice, Gamecube and Wii versions once each, and am really glad to hear its like 1. Yes the time limit could be intimidating, but it was still much better than those underground levels. Im actually glad the EU is getting this first so reviews are up. Have the NL crew drawn straws to see who gets the honour? Regarding new IPs. The free-to-play game that Nintendo is creating is going to be a new IP. They said they don't want to put dirt on the name of current IPs if their "experiment" went wrong. @Araknie I cannot see what the bloke said that warranted that response?He just said he wont be getting it straight away as he hasn't played it before.Whats that got to do with multi platform analysts opinions? I hope this game is three times as big as the first one or even bigger. I want to play this for a long time. Oh, and who said what about no new IP's? Shulk and Pit would like a word with you. Since Pikmin 1?!?!? No, people cared about Wii Sports and Wii Fit and probably a few other NEW IP'S that I'm too tired to look up for you. Blind and Deaf is the person who doesn't care about new IP's, and let me tell you, that isn't the bulk of the population. I borrowed 1 and bought 2 with wii controls. Really enjoyable IP with tons of charm. To the people new to pikmin here i say get it even if you havent played the first two. @Grubdog i liked steel diver a lot. it could use some fine-tuning (wii u could do this right) and a lower launch price tag, but i had great fun with it. Why can't he say what's been done to make the game so good? Did everyone hate the time limit of the first pikmin? Am I alone in liking the stress it put on you? Sounds fantastic. 1 was my favorite of the 2 myself. @Grubdog Steel divers was fun. It was just short. Also no one care about Legend of Heracles for the ds. Nintendo, I want a sequel. the thing that put me off the first releases was the "perma-death" type of feature which I hate. I don't have much time at hands but I love going back to separate levels and trying collect everything, etc and a game so confined and restricted really put me off. I'm excited for PIKMIN 3. Twas a shame since the first one looked and played so good. Gotta play the second one and can't wait for the third one. It always surprises me how few people have played the Pikmin series. Pikmin 1 and 2 are two of my all time favorite games, so to see people missing out on them is a little saddening. In any case, I basically bought a Wii U so I could play Pikmin 3 day one. I've had it pre-ordered since before it had a release date, and I can't wait for August 4. After 9 years, I'm glad to see a lovingly made sequel! @Shworange I liked the limit more because of the bite-sized play that produced. As someone who doesn't game for hours on end I appreciated the fixed-length play sessions. Sounds promising. The only pity is that it took so long to make. I've played most of the original, have the sequel and am really excited for the third game. It looks so well made! Also I love Miyamoto's passion for his projects, this really seems like a labor of love for him. YES I WILL BE GETTING THIS GAME!! I am excited! 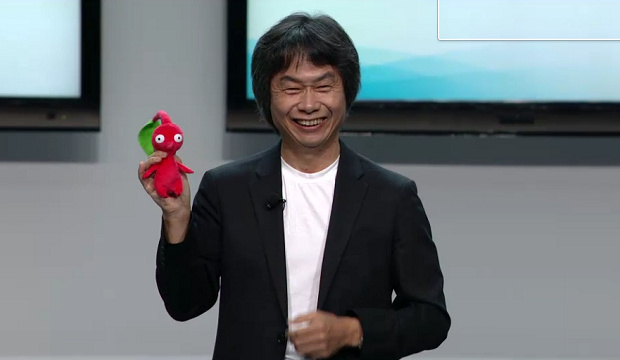 I loved the first two pikmin games, and now Miyamoto-san is saying that this will be the best yet! I can't wait for this game! I should start playing thought the first games again. Thank you so much Shigsy! Pikmin 1 is one of my top games and Pikmin 2 was just...okay. I beat it, sure, but Pikmin 1 is where the real deal was. Pikmin 3 is going to be the best game, or at least in my top favourites. I've been waiting a long time for this. Pikmin is my second favorite video game franchise, so it goes without saying that this will be added to my collection day one. I haven't actually played Pikmin 1, but having played Pikmin 2 through twice, the first time taking a long time and the second trying to do it as quickly as I could, I believe the time limit is what makes the game strategic and fun. On my first play through I found Pikmin 2 sort of dull actually. If there's no time limit it would need some puzzle solving type elements to make it interesting, otherwise you're just wandering around picking up random treasures, not that fun in my opinion. I think the best would be no definite time limit but other incentives to beat it more quicly, stuff to unlock etc. The way Miyamoto talks about Pikmin 3 makes me excited to play it though. Looks gorgeous too! I'm all about amount of content. Pikmin 1 was great, but you can beat it in about four or five hours. Pikmin 2 takes a solid 24 hours, and that's why I prefer it. I've been waiting for this game ravenously for years, but if the reviews come out and say that it has an eight-hour story and that's it, I'm probably going to hold out and get it cheap down the line. In fact, anything shorter than 2 is going to be a disappointment. I mean, we have a gamepad now. Why is there no level editor? That would provide us with limitless hours of gameplay. But Nintendo is all about delivering the bare minimum. Story, timed challenges, vs. mode. Just like Pikmin 2. No change, no advancement. I'm getting sick of it. 1 question, where can i get the Pikmin toys they have?! EDIT: Actually looks like the toys he has is the Pikmin 2 ones you can get on ebay and Amazon, prices are abit steep though since they need to be shipped from Japan. I'm on the fence with this one too. Never played Pikmin 1 and I simply did not give Pikmin 2 enough time on the new control series on the Wii. It simply was not that interesting to me at the time. My daughter and I do enjoy the Pikmin on Nintendo Land quite a bit though so if there's a coop multiplayer on Pikmin 3, then I will probably get it. Otherwise it might be a tough call. I'll have to wait and see the (objective) reviews on it. There are a lot of other titles that I'm far more interested in getting--Lego Marvel Superheroes, Legend of Zelda Wind Waker HD, Game & Wario, Wii Fit U, Super Mario World 3D (maybe), and no doubt a few little indie games and VC titles. I'mmmm SOOOOOOO ready!!!!! But 48 days is a VERY long time. After watching the Wii U Developer Direct - Pikmin 3 video I'm starting to lean a bit more closer to thinking about possibly maybe getting this title. Perhaps. I see that the only multiplayer seems to be the Bingo Battle. We'll have to see about this title as it's not a slam dunk for me. Go Spurs! Pikmin 3 - The game that convinced me i need a Wii U. Been having a good time with my Wii U since so I don't mind the wait. The most excited i been to play a game since Mario 64. This IS the reason I really wish I'll once have a Wii U. And now that it's in HD, it's going to be so immersive, I've no doubt I'll want to live there. But really, I'm an avid fan of the first Pikmin. To me, the time limit is one of the main aspects that makes Pikmin the incredible game it is. The other, of course, is the fantastic environments accommodating the large swarm of colorful Pikmin having to do crazy stuff to survive. It's not that easy, though, to pinpoint what makes this game so great. One thing's for sure, Pikmin reeks of quality: A few minutes into the game for the first time, I knew that Master Miyamoto was deeply involved with this title — you just can't miss it. His involvement equals to an unforgettably fun experience, so I'm VERY glad that he, too, is excited about and pleased with the new Pikmin game. Truly, as of now, if I buy a Wii U, I'd buy it solely for Pikmin 3.